On January 13, 1998, Michigan State University (MSU) inaugurated its first Zoo & Aquarium Science course since the 1930s. 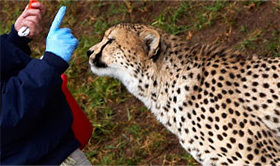 Since then, the past 18 years have seen the development of a curriculum in Zoo & Aquarium Science (i.e., the Bachelor of Science in Zoology with a Concentration in Zoo & Aquarium Science), which integrates many disciplines, including: genetics, nutrition, conservation, ecology, organism biology, evolution, and animal behavior. After developing a strong background in zoological concepts, students embark on semester-long internships at zoos or aquariums throughout the United States. The anchor for all students selecting this curriculum is the course ZOL 369: Introduction to Zoo & Aquarium Science. A formal course introducing topics utilized by the zoo animal industry was not entirely new, but our course focused on science-related subjects. Nearby zoos were quick to provide experts and materials for the course. The students have enjoyed presentations by zoo professionals because they were "real life" examples from on the job. Potter Park Zoo and Binder Park Zoo have even brought live animals to demonstrate how to use ambassador animals in education programs. Naturally there have been limitations to subjects that can be covered in one semester. The students continue with several seminars led by Dr. Richard Snider, the founder and Coordinator of MSU's Zoo & Aquarium Science Program. MSU's Zoo & Aquarium Science Program has grown in popularity for training tomorrow's zoo and aquarium professionals. Its success is largely due to Dr. Snider's supportive ideas to help students become sought-after job candidates. He initiated conversations with Jon Prange, director of San Diego Zoo Global Academy, in 2015 to brainstorm what the Academy and MSU could accomplish together for the zoo and aquarium industry. They concluded that a spectacular starting point was to integrate the Academy e-learning modules into the undergraduate classroom, beginning with ZOL 369 in spring of 2016. The Academy offers 10 e-learning modules that fit nicely within ZOL 369's syllabus, augmenting the lecture topics and assigned readings. Viewing these modules and completing the corresponding tests have replaced the standard Q&A written assignments in the students' final grade calculation. In partnership with Academy partner CypherWorx Inc., a MSU-branded, custom-learning platform was developed for the course. Academy modules are preloaded one by one to the site's Course Catalog (following the lecture topic sequence) and subsequently assigned to students. Once a module deadline passes, students may review module content, but the test becomes unavailable. Within deadline constraints, students may retake the module test multiple times until they have passed the test with a score of 90% or higher. Individual scores are recorded and accessed by MSU's Academy Coordinator, Katie Licht, for grading purposes. Upon completion of the course, successful students will be granted a certificate authorized by San Diego Zoo Global Academy and MSU. MSU's Zoo & Aquarium Science students are excited about this new résumé-building opportunity. According to ZOL 369 student Mariah Faszczewski, "The modules have greatly expanded my awareness about critical knowledge required to (sic) taking care of captive animals. They are interactive, keep me engaged, and I enjoy learning the material. The real-life case studies help connect everything that I have been learning. Now I feel more confident about subjects that are necessary for me to succeed in my future career as a zookeeper. The modules correspond well with our in-class lectures and they help with my information retention." If all goes well, Academy modules will also be incorporated into MSU Zoo & Aquarium Science topical seminar courses in the future. The San Diego Zoo Global Academy will have an exhibitor table at the mid-year conference, taking place in Omaha, Nebraska this month. Please come by and see us! We will be at the table on Tuesday, March 22 and Wednesday, March 23. 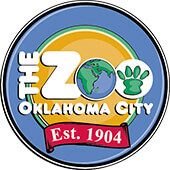 The Oklahoma City Zoo is part of the Academy's collaborative learning environment. Welcome! Join the fight to end extinction: rally for rhinos! Big and bold, rhinoceroses are easy to remember. But they might not be around much longer. Only five species remain—two in Africa and three in Asia—and all are feeling the pressure of poaching and illegal hunting for their highly prized horns. The newest edition to the Animal Species Series, Rhinoceroses, was added to the Academy course offerings in March 2016. It explores the physical characteristics, reproduction, distribution, and current conservation efforts to help save the five living species remaining on the planet. The module includes rhinoceros photos on each slide along with interactive learning exercises, videos of rhinoceros behaviors, and full audio narration. Quick quiz questions at the conclusion of the module let you assess your knowledge; you'll be surprised about how much you learn. In today's world, conservation is more challenging than ever. With the current rates of extinction and the threats facing wildlife worldwide, we all have a lot of work to do. Where to start? Understanding. 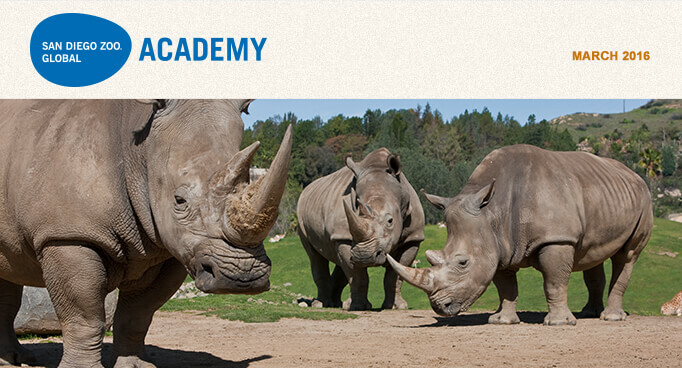 To that end, the San Diego Zoo Global Academy has launched a new course series that will address topics pertinent to conservation. These courses will include the role of zoos and aquariums, conservation goals and strategies in our industry, and conservation challenges, as well as the meaning of conservation for the public, interpretation of conservation topics and issues, and communicating conservation work, programs, and successes to our guests and audiences. The first offering in the Conservation Series is Ending Extinction. This course, divided into two separate modules to be taken individually, is designed to define extinction and its causes, present the meaning and importance of biodiversity and genetic diversity, teach participants about how and why species are vulnerable to extinction, and present solutions and case studies of ongoing and successful conservation projects. The topics in this course help to support the Association of Zoos and Aquariums (AZA) new initiative Saving Animals From Extinction (SAFE), as well as San Diego Zoo Global's new corporate vision of fighting against extinction—along with the thousands of conservation programs taking place at zoos and aquariums around the world that are working to keep species from going extinct. Ending Extinction Basics: Part 1 launches this month and is available now on the Academy site, to be followed by Part 2 later this year. This course will be helpful to those who are looking to establish a knowledge base about extinction, species diversity, and approaches to conserving wildlife, as well as those who present, interpret, and discuss these hefty topics with visitors, students, supporters, and donors at a zoo or aquarium or as part of a classroom curriculum. Extinction, conservation, diversity, species recovery, changing behaviors: anyone considering what part these play in today's zoological community, trying to wrap their arms around such large concepts, and looking at how the heck to explain them to someone else will find value in the Ending Extinction SDZG Academy course. Lock in Your Renewal Rate for 2016! The Academy continues to build out training for our industry, and will continue to be a great value for all participants. There will be a price increase for new institutions subscribing to the Academy that is anticipated to go into effect at the end of the first quarter 2016. Existing subscribers will be able to renew at their existing rates. Act now to lock in the current rates for your institution. Please join us for the Administrator's Users Group Webinar hosted by Academy partner, CypherWorx. The next webinar is Wednesday, March 16, 2016, at 11 a.m. PDT. To Register for the Webinar: click here. After registering, you will receive a confirmation email containing information about joining the webinar. The Animal Welfare Act (AWA) compliance is an important starting point. Anything less than compliance (especially if there is a pattern of noncompliance) can pose challenges but also opportunities for growth and improvement. Going beyond the regulations, particularly in ways that further enhance animal welfare, is necessary for the zoological community in order to keep pace with the evolving public consciousness about animals. The best and simplest way YOU can contribute even more to your zoological organization's AWA compliance is to consciously plan and work on your own professional development. The more aware and knowledgeable you are, the better you can fulfill your responsibilities—or better yet, create new and better ways of doing so. Investing in the fuller attainment of your potential has a direct impact on AWA compliance and animal well-being. The AWA regulations recognize this in various provisions. See, for example, these references, which speak to having appropriate "knowledge of the species [YOU] maintain"—9 C.F.R. § 2.131(a); and "adequately trained staff"—9 C.F.R. § 3.132. The marine mammal regulations, originally developed by a broad array of stakeholder groups during the Marine Mammal Negotiated Rulemaking, actually require documentation of completion of a training course including, "species appropriate handling techniques, animal handling techniques, and information on proper reporting protocols, such as recordkeeping and notification of veterinary staff for medical concerns "—9 C.F.R. § 3.108(c). Personal professional development, like enhancing animal welfare, is an ongoing process. Since publication of Excellence Beyond Compliance in 2014, I have greatly expanded my still-unfolding understanding of the AWA and animal welfare. Every column like this, countless programs and talks, constant regulatory troubleshooting through innovative improvements, and studying the Academy's Animal Welfare course have all contributed to making my efforts on behalf of animals much more effective. Make the investment of your time to develop yourself and enjoy greater fulfillment in doing even more to better serve the animals in your care. Like all animals, fish need a constant supply of oxygen to drive the many metabolic reactions in their body. Oxygen (which comprises 21% of air) does not dissolve in water very well. In fact water holds 5% of oxygen compared to the same volume of air. This is what make fish gills such an amazing organ. The gills, due to their counter-current mechanism, are so efficient at extracting oxygen from the water that 80% of oxygen is extracted from the water in one pass through the gills. There are two sources of oxygen in water: simple diffusion, and photosynthesis. Simple diffusion occurs across the air/water interface. The air pressure "pushes" the oxygen into the water. In the natural environment, wind and wave action over bodies of water will increase this rate of diffusion. In our aquariums, we use various devices to increase the rate of this oxygen diffusion. The second source of oxygen is from photosynthesis by plants. Plants use carbon dioxide (CO2) and sunlight to grow, and in the process they release oxygen. Aquatic plants are no different and consist of large water plants (macrophytes) and the microscopic, single-celled algae (microphytes). This process only occurs during the day, since sunlight is required. Therefore, in ponds there can be significant differences in oxygen levels between the day and night, with low (and sometimes critically low) oxygen levels early in the morning. In most inside aquarium displays, this is not an issue, but it can be with outside displays. The term Dissolved Oxygen (DO) refers to the level of oxygen dissolved in the water. It is usually expressed as mg/L (or parts per million, ppm). Low oxygen levels can be a major stressor to fish, and the oxygen level in the water may be a limiting factor. A lack of oxygen (anoxia) in the water will often result in fish up at the water surface attempting to take in extra air: "piping." Deaths can result. Fish species have adapted to differing minimum levels of oxygen. Generally, a minimum of 6 mg/L of oxygen is considered safe, especially for fish species that live in the oceans and running rivers and streams. Some hardier fish families such as catfish and the cyprinids (carp family) can tolerate lower levels. In the next newsletter, we will look at the various factors that impact the oxygen levels in the water and how to increase those levels. The San Diego Zoo Global Academy is excited to share an additional Academy subscriber benefit regarding our collaboration with Dr. Jones: as an Academy subscriber, you are now entitled to a discount on the e-quarist™ courses. Module Six is now available &#8212; Nutrition and Reproduction.